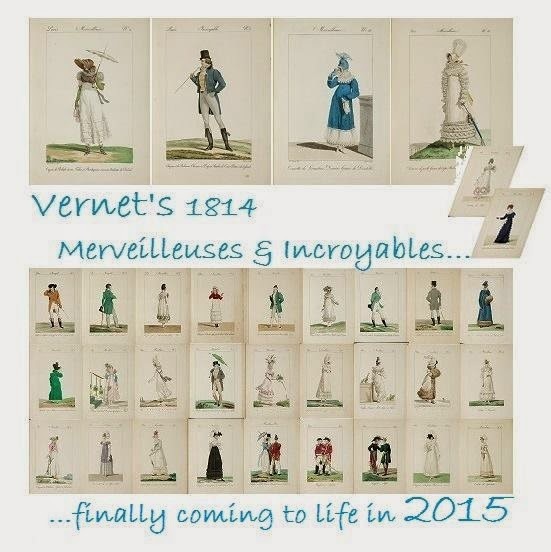 A Frolic through Time: Scaled Drawings of American Regency Garments Available! Scaled Drawings of American Regency Garments Available! Polly, a delightful friend, and fellow period fashion admirer, had the good fortune to attend a Jane Austen festival in Louisville a week or so ago. 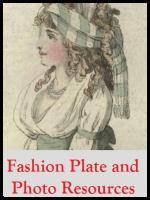 There was a fashion show, and many of the reproduction garments shown were based on Jennie's patterns, or Janet Arnold's Patterns of Fashion, or similarly scholarly resources, or from scaled drawings taken of actual garments in museums in the eastern U.S.. Polly thoroughly enjoyed the fashions. Photo: Scaled drawing of Early Ohio Regency dress from the Ohio Historical Society collection. On The 19th U.S. Regiment of Infantry site. They have made the scaled drawings available to all, a gift for which we should be truly grateful! 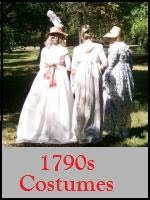 There are scaled drawings for a 1795 day dress, three day dresses, and a wedding dress from 1800-1820s. There are also a ca. 1800 brassiere pattern, stays and child's stays, and a full apron. Most of the patterns have detailed photos of the original garments to go along with them. There are photos only of several other dresses and a pretty chemise from about 1820 that's lace trimmed and has a ruffle (!! ), and at the fashion show the presenters promised to make more scaled drawings available. One could make up garments from the drawings, with some work, or tweak Jennie's patterns, and I love the fact that you have so many photos of the exteriors and interiors of the dresses. The drawings are on the The 19th U.S. Regiment of Infantry reenacting unit site, at http://www.19thus.com/. See the Women's Clothing section at http://www.19thus.com/WomensClothing.html. Photo: Reenactors at an event in New Orleans, 2005. On The 19th U.S. Regiment of Infantry site. Their ensembles are very nice indeed. Oh..next year, I am going to move heaven and earth to get to that Jane Austen festival...I know that had to have been spectacular. Did you see that Sotheby's just auctioned of a rare lst edition of Pride and Prejudice? It went for $29,980. You're most welcome. By the way, that's a neat moniker you have. Myna birds are cool. I just came to catch up on your blog news today, after having not visited for too long. I was delighted to find the link you provided in this post! What a treasure trove!